This yummy S’Mores Pizza is a fun way to end pizza night or as dessert on ANY night! Preheat oven to 425º. Lightly coat large baking sheet with cooking spray. Fold bread dough in half and shape into a ball. Place on baking sheet. Brush dough lightly with 1 Tbsp melted butter. Press and stretch dough with palms of hands into a 12-inch circle. Pierce several times with a fork. Brush again with 1 Tbsp melted butter. Back in preheated oven for 15-20 minutes or until golden brown. While dough bakes, mix 2 Tbsp melted butter with graham cracker crumbs; set aside. Remove dough from oven and brush with 1 Tbsp melted butter. Evenly sprinkle graham crackers over crust. 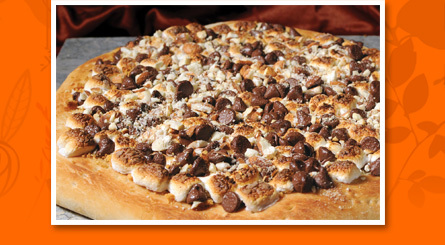 Top with chocolate chips, followed by marshmallows (spread to cover crust). Set oven to broil. Return pizza to oven on middle rack and broil 1 min or until marshmallows are golden brown. Slice and serve while warm.